Two hundred years ago, the so-called “Civilization Act” began a policy of taking American Indian children from their parents and having them placed in boarding schools—a practice that only started to wind down in the 1970s. This year’s new congressional class has been widely hailed for its diversity. But the stories told by our nation’s museums too often remain the whitewashed variety, as the daughter of one member of that class explains. The Native American Journalists Association announced a partnership with the Institute for Journalism & Natural Resources to promote Native involvement in the national conversation around environmental issues. An award-winning journalist, in response to objectionable editorial decisions by mainstream publications, has created an “indigenous version” of her articles to get her voice heard. The notion of cultural justice has as a core tenet language reclamation and revitalization. This newswire has many implications for other fields of work. 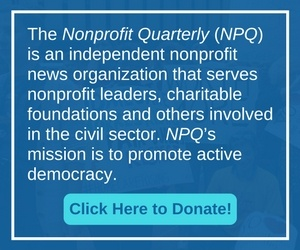 As Indian Country Today rebuilds, the paper faces the challenge of maintaining editorial independence when its nonprofit sponsor is controlled by the tribal governments about whom it frequently reports. This venerable publication was shut down last year but has now reopened under the auspices of the National Congress of American Indians. The National Museum of the American Indian will now feature a mile-marker post from the Standing Rock protest. As museums that lift up the stories of marginalized communities gain in number and prominence, how are they recasting the museum’s curating role? Indian Country Today Closes: Is Philanthropy Awake? Founded in 1981, Indian Country Today announced earlier this month it was ceasing operations.